GIRL EARNS £5 PER WEEK. The whole kingdom is mapped out in eleven munition areas, seven in England and Wales, two in Scotland, and two in Ireland. The areas are subdivided into a varying number of districts, and each district has a local board of management, acting under the Ministry of Munitions. The boards of management have drastic powers for taking the lathes, engineering equipment, and factories in their areas. At the Ministry of Munitions is an official for each local area. At one factory in Birmingham 7,000,000 rifle cartridges are turned out every week. Of the 7,000 employees at the factory, over 4,000 are women, each earning from 30s. to £3, and even more, a week. 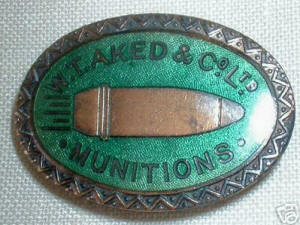 In the Leeds area there was not a single munition factory at the beginning of the war. Now there are 500. The National Shell Factory, at Keighley, turns out thousands of shells a week. So keen is the competition between the munition factories in Yorkshire to break records in output that they have a challenge shield for the best shift, the competition being a weekly one. 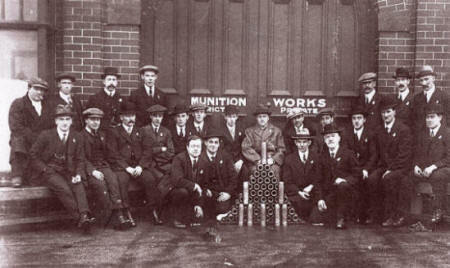 During the 1914-18 War many workshops and factories were converted into munitions factories. W.T.Aked's Garage in St.Annes during the 1914-18 War when it was making munitions (I think this later became the Fylde Box Company building on St.Andrew's Road North).